Prepare to be stunned by fantastic, new colour blends and edgy styles in this gorgeous group of these stunning long pixie cuts – short hair ideas to make you gasp in admiration! These cute daily hairstyles and special long pixie cuts are full of groovy, funky and fabulous long pixie cuts and colour ideas! Great for weddings, stage appearances, modelling assignments or just to show you’re a highly-styled fashion icon! Cute colored pixie cut with bangs: This is not one of the most recommended daily hairstyles, (ha ha) but it’s a runaway success as an evening hairdo! 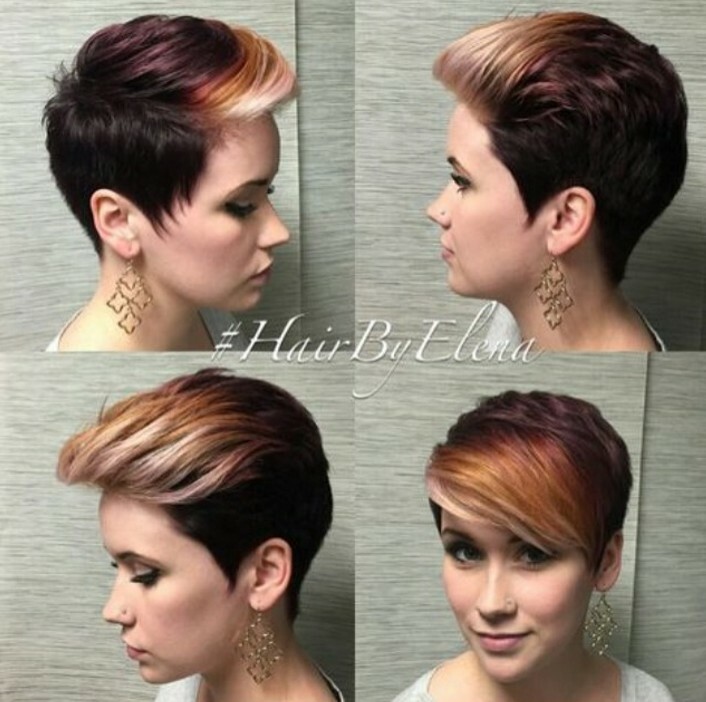 Based around the short back and sides, long pixie cuts can have extra length on top to use as an artist’s palette of sunset shades. This inspiration for your party-ready, short haircuts combines violet roots, changing to crimson red and then soft yellow, with beige-blonde underneath! The extra-long, side-swept fringe (bangs) from a deep side parting, is a great way to balance out a long or a round face. And the final touch of flirty fun on this outrageous pixie cut style is the asymmetrical flicked out wave at eye-level. This is one of those very stylish, daily hairstyles you can wear for work and leisure! The back is expertly graduated into the nape of the neck, with a lighter, bowl-cut layer around the crown. The extra-long asymmetrical fringe (bangs) is draped seductively over one eye. Colourwise, the model’s naturally fair hair has been lightened to a white-gold shade with a subtle touch of silver-blonde highlights in the fringe. This cute pixie cut draws attention up to accentuate the eyes and will take the focus off a slightly larger nose. Suitable for fine and medium hair and most face shapes – round, oval, heart and long! And here are some great pixie cuts for fine hair. Light-up your brown hair with short hairstyles and gorgeous golden-blonde highlights that accentuate the texture in layered, long pixie cuts. The styling of all daily hairstyles based on similar short haircuts, can be brushed forwards from the crown with a fabulous side-swept long fringe. Or try wearing a wave/quiff around the front hairline for a glamorous evening look. A long, full fringe across the face is a great trick to break the symmetry of a round face or ‘shorten’ a long face. Suitable for medium hair and fine hair, as the lightening process will add lots of body. Short hairstyles always lead the new trends, like this example of the cute pixie cuts that create a runway ready look instantly ! 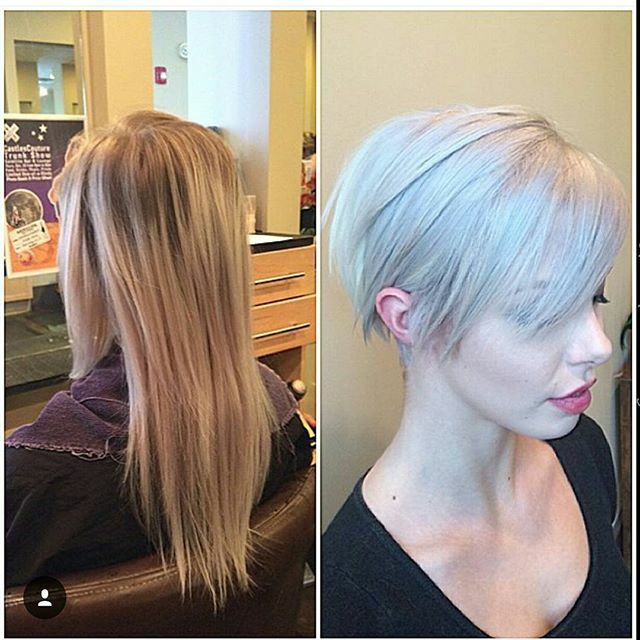 If you’re attending interviews for jobs, or keen to get promoted, long pixie cuts in platinum-blonde are a fabulous way to show your ‘switched-on’ contemporary image. How many women are there in your workplace with long, straight browny-blonde hair? Don’t be one of the herd who never gets noticed. If you want to get ahead, choose daily hairstyles that will get you noticed, like long pixie cuts with sliced layers in a cool blonde shade! Suitable for most face shapes and medium – thick hair. When the season’s rainy and windy, long, shaggy pixie haircuts make the best daily hairstyles and party looks! The more windswept you look, the trendier your image! 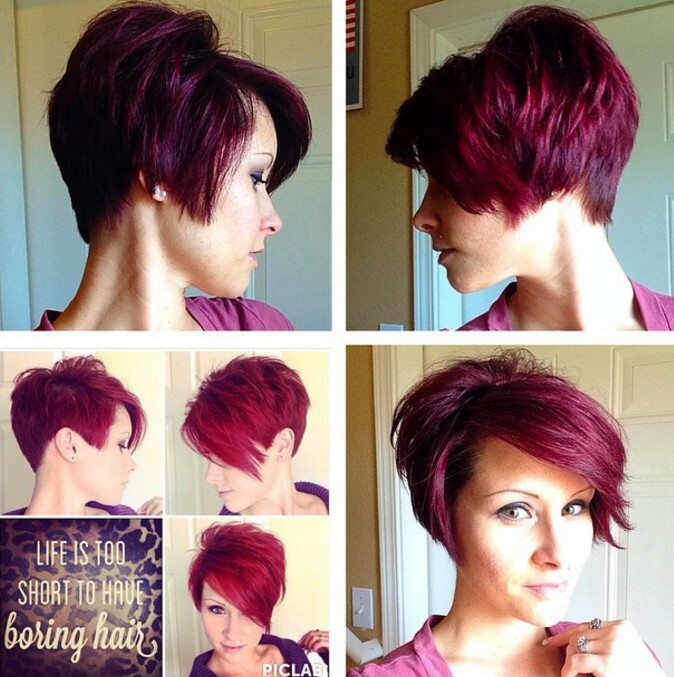 This extreme, asymmetrical long pixie haircut’s a great shape for a round or oval face. It can also be adjusted to flatter a long face – just move the side-parting and the angle of the fringe to get tailored short haircuts. Shaggy cuts use the volume of medium and coarse hair types for the basic shape with highly textured tips creating the shaggy pixie cut’s ragged outline. The extreme short haircuts’ vibe in this image is complemented by the latest, ash-brown bronde colour, plus subtle purple tones highlighting the top! The fashion world’s colour-wheel has been spun and given us yet more new ideas in highlighting colours for daily hairstyles and special occasions. In addition, as these pixie haircuts demonstrate, you can make pixie cuts look just like a beehive upstyle from the 50’s, which required long hair! On thick hair, the back is stack-cut to create a natural bump of volume around the crown, then back-combed (teased) to exaggerate the curve. 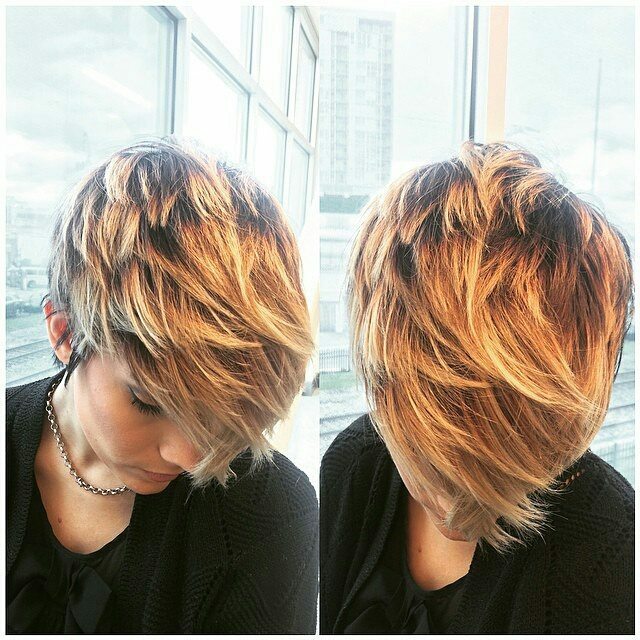 For a really edgy, fusion look, one side is close-clipped like 70’s punk short haircuts and the long fringe is accentuated with amazing ash-brown streaks! 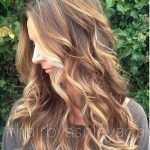 Sliced layers on thick hair get rid of unwanted bulk and create chic, vertical movement in defined strands. 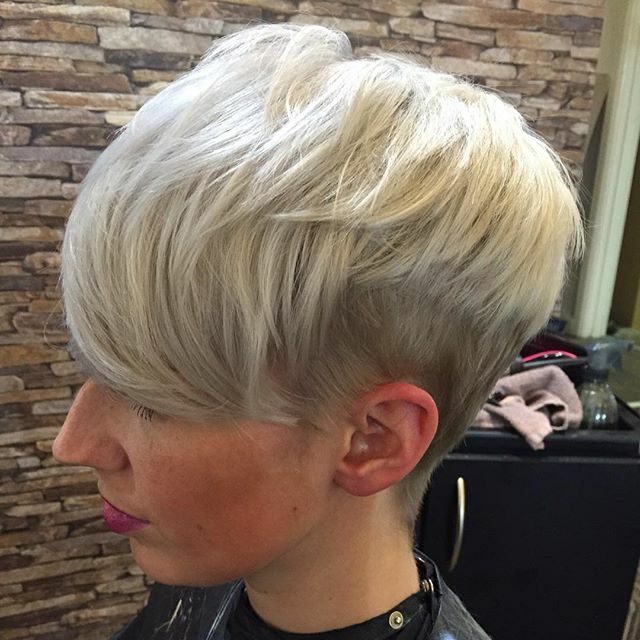 This is one of the choppy pixie cuts that’s anti-hairstyle, as it’s totally ‘bedhead’ and has a matte finish! It suits most face shapes, as your stylist can make small adjustments to flatter oval, round, long and heart-shaped faces. The choppy-cut layers radiate from the crown in a fairly natural way, with a long fringe accentuating the eyes. The raggedy layers contrast with the sharply textured tips making this one of the easy daily hairstyles, that’s also very high fashion. Dress it up with an accessory for an all-out glam look at night! 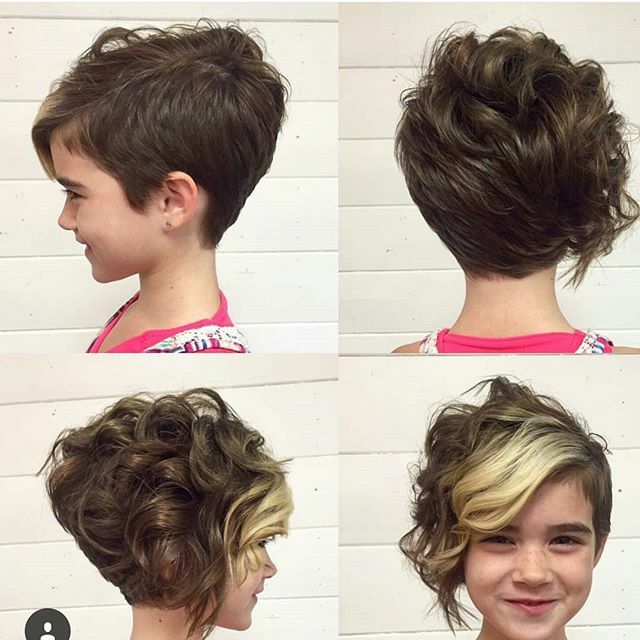 For stylish boycut pixie cuts, choose buzzed short hairstyles with a long, draped fringe. This example of a buzz-cut back and sides short hairstyles’ option is both trendy and easy to style. The top is left in long layers from a line running around the sides and back of the head, creating extreme asymmetry. Combed forwards from just below the crown, creates extra volume as it cascades over one side of the face in heavily textured, spiky strands. Daily hairstyles like this suit most face shapes, except a long thin face. The focus is on the eyes and upper face and for evenings you can wear a quiff or waves atop high-fashion, tough-pixie haircuts. I love the asymmetrical short hairstyles that have 4 different viewpoints. 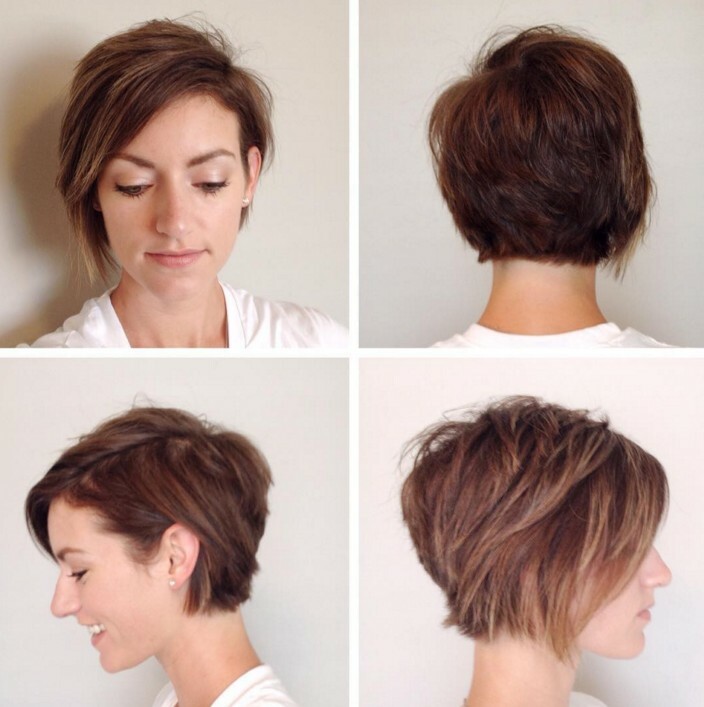 This short bob has a pretty blunt finish at the nape, with a little wavey movement above. Seen from the longer side, the back has been cut to make an attractive 60’s-style bump of volume below the crown. The front shows off the whole face, with just one corner of the forehead covered by a trendy, long fringe. And highlighting the textures in this fab example of the most popular daily hairstyles right now are blonde dual highlights! Best on thick hair and suits most face shapes. 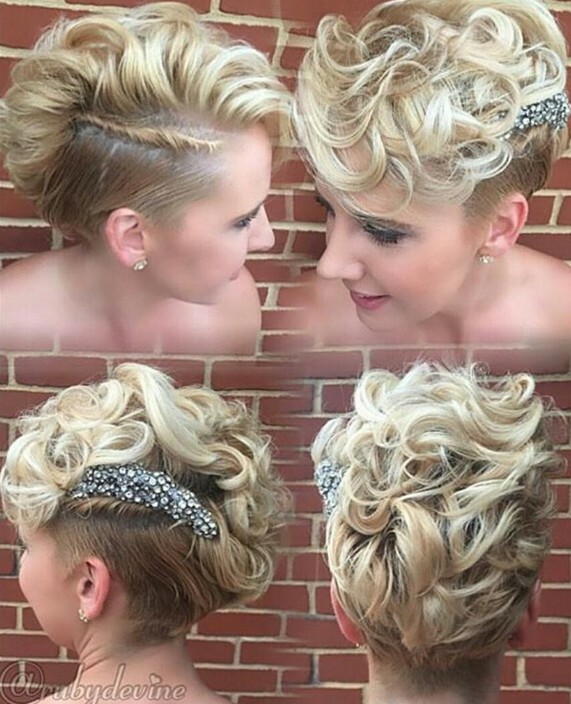 This is a great pixie cuts’ idea for a special occasion, from a short bridal hairstyle, as a wedding guest or bridesmaid or any type of formal event. It works best on long pixie haircuts and uses different textures to help create a striking short-hair updo. Below the side parting, there’s a twisted line above sleek combed-back sides. The top is arranged in defined pin-curls and continues in waves down the back to form a lovely faux mohawk. Glitter hair-combs or slides (barrettes) finish off this super-cute short haircut updo perfectly! 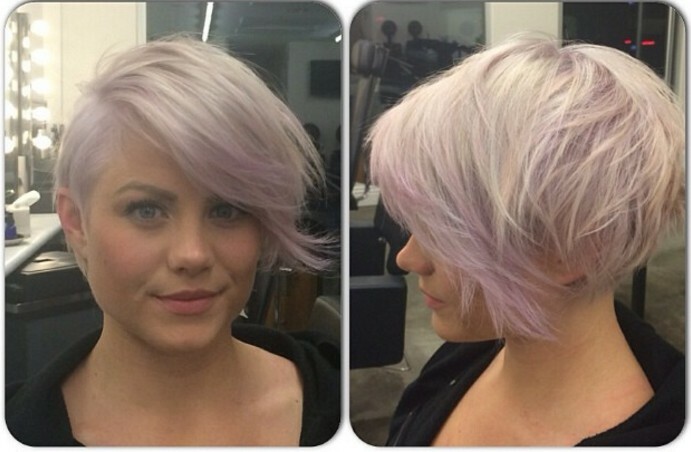 Lavender tones look fabulous on platinum and pale-gold pixie cuts, as a hint of pastel colour softens white-blonde. Pixie cuts like this can be achieved on fine, medium or thick hair types and suit most face shapes and ages! The long, back layers are styled in a messy, windswept look emphasising the lovely rounded curve that gently brushes the nape. The deep side-parting allows a substantial section of hair to be combed forward into a diagonal long fringe with a cheeky, little flick on one side. Suitable for daily hairstyles and evening wear, this is one of the best pixie haircuts for looking adorable! Pixie makeover from long hair (with a lot of screaming)! 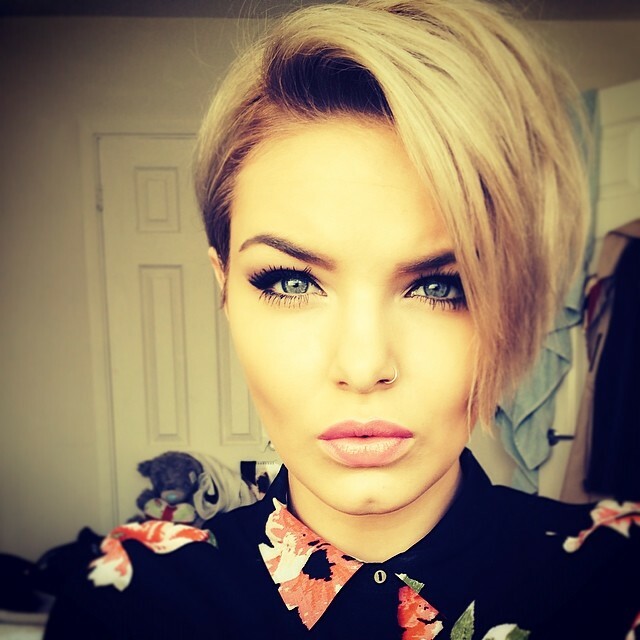 Short haircuts for 2016: The ‘before’ pictures show that this attractive young woman has a long face and has been wearing the worst possible hairstyle for long faces – long, straight and no fringe! (Scream!) But one look at the stylist’s confident expression, confirms that she knows how much better her client will look with an asymmetrical long pixie cut. 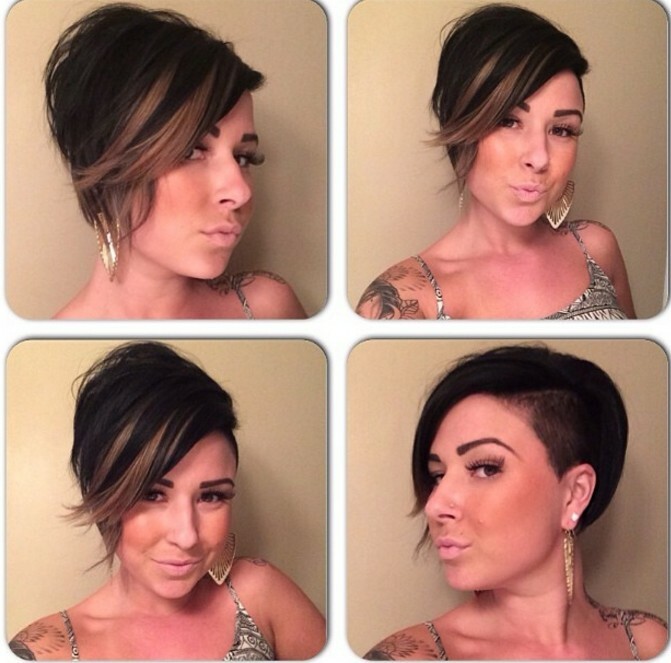 The final photo shows a flattering short hairstyles makeover that’s perfect for a long face. The main feature is a shiny, smooth forward moving section from a blurred side parting. The long fringe makes a strong, diagonal line across the face, instantly ‘breaking’ the length The pixie cut’s side sections taper in to a length well above the chin, creating a wider look with the focus on the eyes and upper face. Have you tried this new colour idea yet? I’m guessing not, but it’s a fab look for daily hairstyles, parties and evening wear! 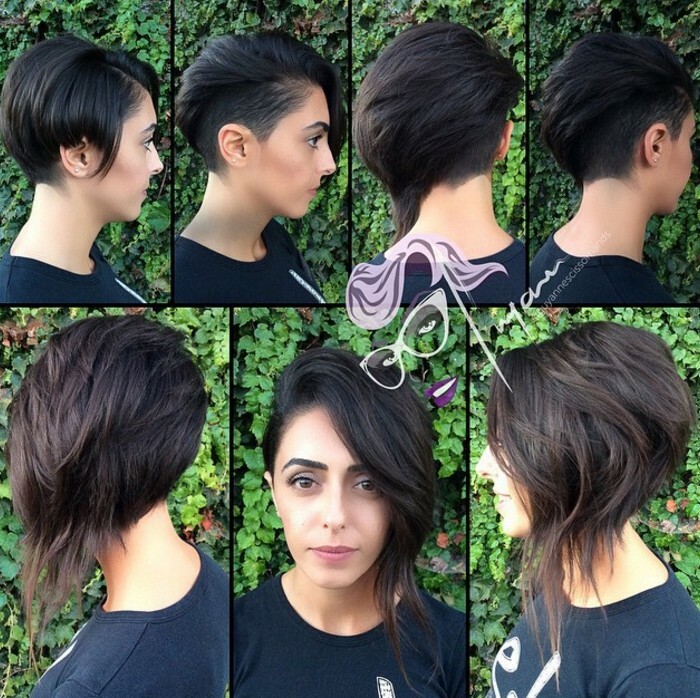 The clean-lines of versatile pixie hairstyles like this let you vary your look for any occasion. The top is tinted in wine-red, copper, gold and platinum-blonde bands, which can be brushed back, or to one side or styled forwards into a stunning long fringe. The back is cut into the neck and the sides are kept short with sharp points, which can also be combed forwards to make a feathered outline at the temples. 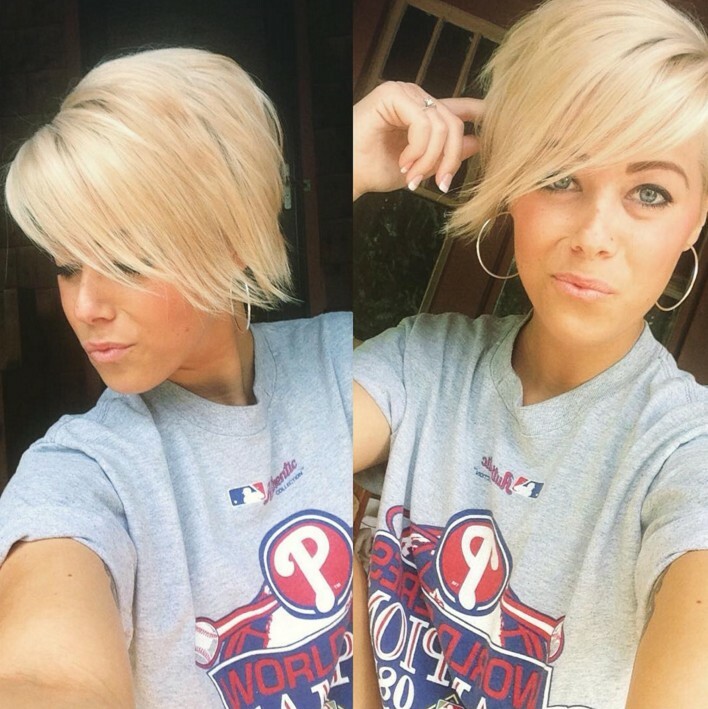 If you like to stand out from the crowd – this is definitely a great short haircuts option to consider! For thick hair with a bit of natural wave, pixie cuts often make the best easy-care daily hairstyles. 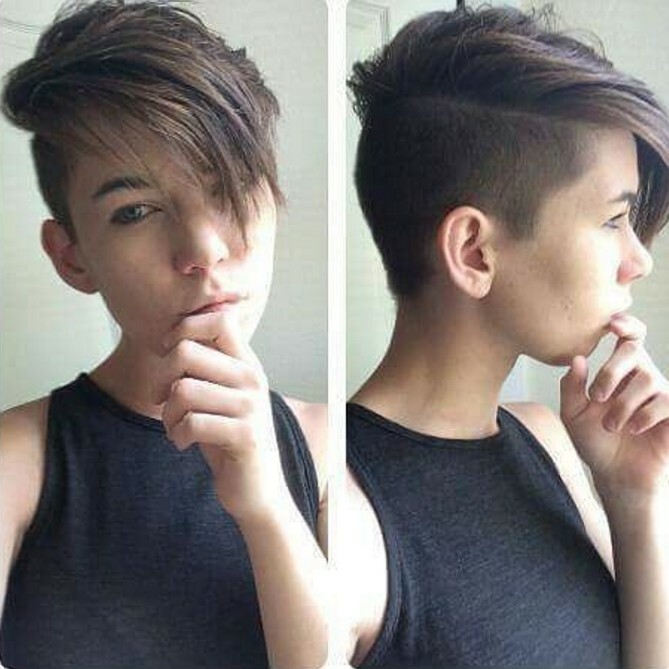 This long pixie uses the natural volume of thick hair to create a highly textured, wavy comb-over. This is one of the short haircuts that still leaves enough length to create a lovely flicked up finish to the fringe, which continues along one side of the head. The back and sides are left longer than some short hairstyles, allowing for a variety of looks e.g. combed forward with defined, tousled strands, smoothly brushed back from the forehead or with a curly quiff! This pixie suits lots of different face shapes – heart, long, round and oval. 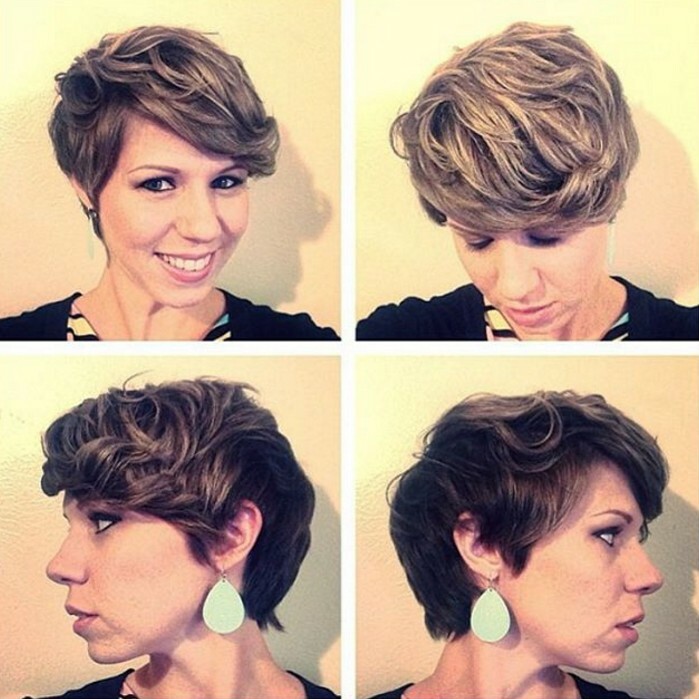 Sometimes short bob hairstyles and long pixie cuts overlap, but they can be both! This stacked-back pixie cut’s suitable as a trendy daily hairstyle and with a diamanté clip, headband or other hair accessory, becomes a cute short hairstyle for evenings. It’s also a pixie hairstyle with extreme asymmetry between all sides. The back is layered to create a lovely bump of volume at the crown and there’s also an off-centre point at the nape! The extra-long fringe and top layers are highlighted with dual blonde streaks that accentuate the texture and movement. With one side casually pushed back, this is another of the latest daily hairstyles that suits most face shapes and accentuates your eyes! 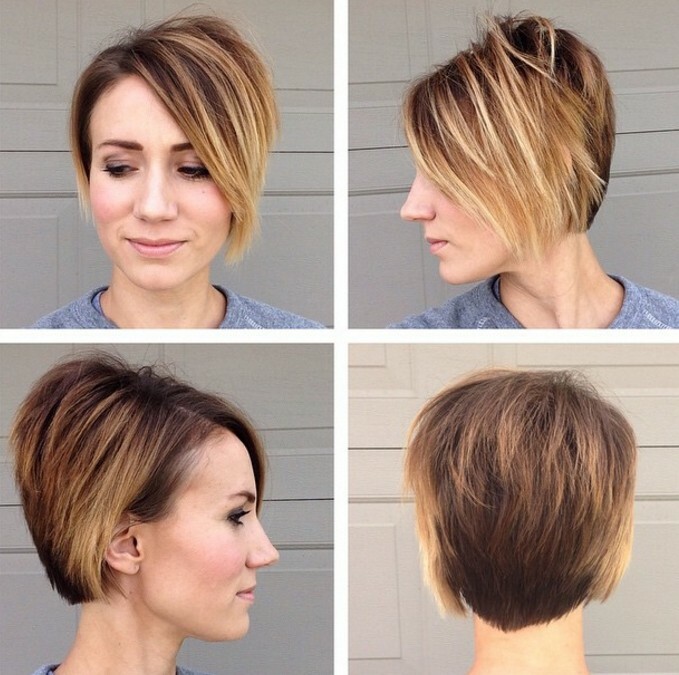 This extreme asymmetric look is one of the most radical long pixie cuts right now! It’s an original daily hairstyles’ option for anyone with a strong sense of individuality. 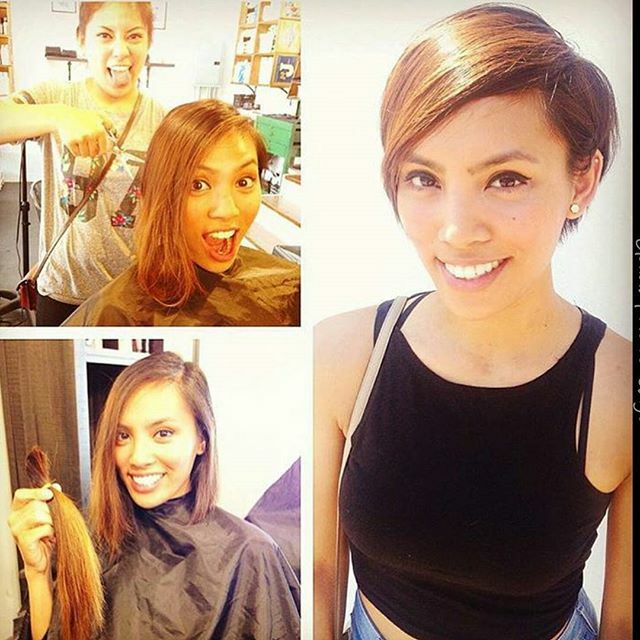 The shorter side has a buzzed undercut following the hairline and the top section is left in long layers. The other side looks like an A-line bob with a steep angle from the back running down to wispy long strands hanging below the collar-bone. Short hairstyles for thick hair don’t come more edgy and attractive than this and the wavy section draped over the face creates a softly flattering finish! 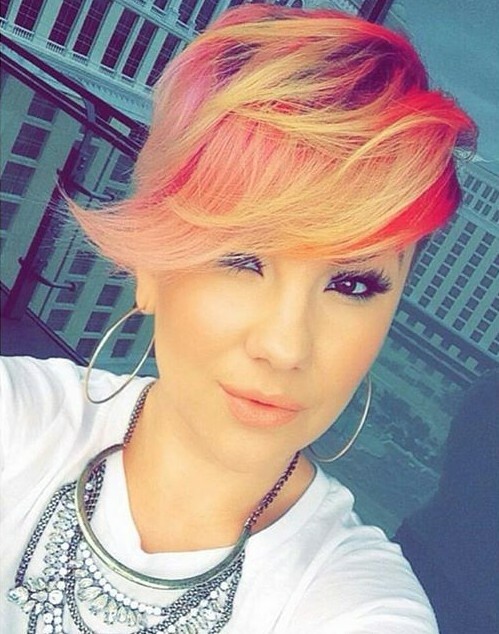 If you love this style, you may love the latest popular mob hairstyles, check it out here. ‘Life is too short to have boring hair!’, so get a load of these striking pixie cuts in wine with deep pink and purple tones! Pixie cuts are perfect for a strong, all-over colour as short haircuts are easy to maintain and style. These short hairstyles show a vintage 60’s look with a back-combed crown and the hair trimmed to finish just below the ears (above). And the shorter look (below) is one of the authentic, 1960’s Mod pixie cuts, with the hair cut around the ears and a long, side-swept fringe covering one side of the face. Suitable for long, round, oval and heart-shaped faces, these daily hairstyles create a daring and very stylish image on medium and thick hair! This long-fringed short haircut’s definitely got an assertive attitude and makes a fab face-frame for round, oval, heart (and long face shapes, if you style the fringe diagonally to reduce the length of the face). The hair is cut in long layers with a slightly choppy finish and an asymmetrical shape. The high wave over the forehead adds length to a round face, and hair draped over the outside edge of a broad forehead helps minimise the width. Casually tucked behind one ear minimises a broad or round face and focusses on the eyes. The textured tips ending above the chin, accentuate the lips and this is another of the cute pixie cuts that’s suitable for daily hairstyles and as a sophisticated, smooth evening hairstyle! 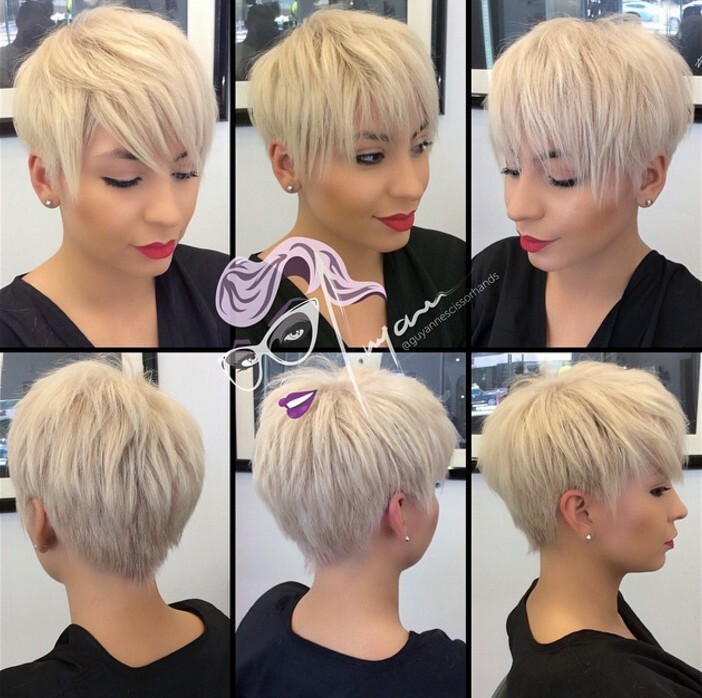 This season’s platinum blonde pixie cuts are longer with a slight shift towards a more flattering white-gold blonde shade that’s less harsh than platinum. This is an example of daily hairstyles for thick hair that are highly asymmetrical with a short stacked back and one close-clipped side. From the deep side-parting, the thick section of long lengths is swept up and back-combed to further exaggerate the volume on top. Then a messy, long fringe is pulled down to cover the forehead and one eye, with just a hint of an upward flick at the sharply textured tips. This is one of the glamorous pixie cuts that’s taken over from the outdated, long, blonde look in today’s hottest urban short haircuts! As you can see, we never need to feel bored with our hair, with this fab gallery of cute pixie haircuts to inspire and update our style. The great thing about daily hairstyles and evening do’s based on pixie cuts is that they flatter a wide range of face shapes and are suitable for fine, medium and thick hair! Find more latest haircuts on hairstylesweekly!